How to use your household notebook or home managment binder? Get inspired! 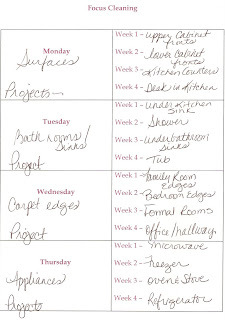 These household notebook tours, hosted by bloggers on the Web, show how to create and use a household planner in your organized home. So you really want to go under the hood of a working household notebook? Quilting blogger Bren, of Pieces From Me, hosts a binder tour of all binder tours! 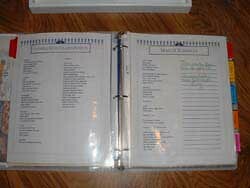 Including scans of working planner pages, Bren's binder tour gives a great overview of the "how" of using a home management binder. She's sharing lots of photographs, so be patient while this page loads; it will be worth the wait! Homeschooling mother of a large family, blogger Ladyofvirtue had specific requirements for her home binder: portable, practical, pretty and personalized. A comprehensive look inside the Household Notebook of blogger With The Fruit of Her Hands, this binder tour should help anyone struggling with scheduling issues. A bonus: check out the creative use of stick-on tabs plus page protectors to subdivide a larger binder. A good description of the how-to behind a home management binder, from blogger Samara Jane. Nicely done! When blogger Elizabeth and her friend Kim took on the challenge to create household notebooks, they aimed high. Deciding to create more than just a simple binder for household information, they envisioned their notebooks as "living books" that would help teach their daughters to keep house. In these posts, Elizabeth shares her Foss Family Home Companion, while Kim outlines her Family Management Journal. Both notebook tours go further: they explain the thinking behind these two young mothers' decision to create order for their families, now and for the future.